Many years ago, in India, a young boy was obsessed with eating sugar. When he woke up in the morning, all he wanted was candy. After lunch, all he wanted was chocolate. And just before he went to bed, he would tiptoe to the kitchen and eat two big spoonfuls of sugar. No matter what his mother said to him or what she did, she could not break him of his habit. And so she decided, one fine summer day, to take her son to see his idol, Mahatma Gandhi, who she hoped would talk some sense into the boy. The mother and son walked for hours, from their remote village, to make their way to the great saint's abode. When they arrived, Gandhi's attendant, upon seeing how anxious the mother was, ushered her and the boy immediately into Gandhi's room where he was sitting quietly, sipping tea. "Oh great Saint," the mother began, her son trailing behind her. "I humbly ask your counsel." "What seems to be the trouble, my good woman? 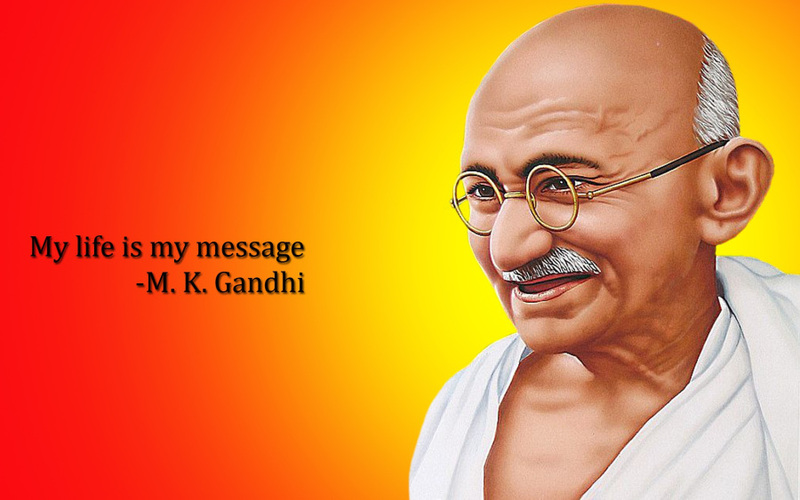 ", said Gandhi. "It's my son," she explained. "He's totally addicted to sugar. Nothing I say helps. Nothing I do. Will you please talk to him now and explain how bad it is for his health?" Gandhi smiled, closed his eyes and meditated. Five minutes passed. Then he opened his eyes. "Good woman," he explained, "I completely understand your situation. I feel your pain. Please return in two weeks and we shall talk again." The mother grabbed her son's hand and exited, confused and disappointed, especially after traveling such a long distance. Two weeks later she returned with her son. Again, the two of them were ushered into Gandhi's room. Again, Gandhi was sipping tea and smiling. Without a moment's hesitation, he turned to the boy and said" "Young man, you need to immediately stop eating sugar. It's very bad for your health." The boy nodded, bowed his head, and agreed. His mother, now more confused than ever, leaned forward and, in barely a whisper, asked Gandhi why he needed two weeks to tell her son such a simple thing -- something he surely could have mentioned two weeks ago. "My dear woman," Gandhi explained, "two weeks ago, I was addicted to sugar myself. I needed these past two weeks to kick the habit!" What funky habit, being expressed by someone around you, would you like to see disappear? What can YOU do, within your own self, to go beyond its grasp? A new thought and latest trends are very interesting to the readers like us. Getting all the information about different topics is a hobby for some readers. Websites like this helps to get good knowledge. Some of the writers are simply writing on a topic without doing any effort to for the work. While I read your article and the article itself shows your effort. The contents has arranged in a great structure.